Michigan is a U.S. state located in the Great Lakes Region of the United States of America. The name Michigan is the French form of the Ojibwa word mishigamaa, meaning “large water” or “large lake”. Michigan is the 8th most populous of the 50 United States, with the 11th most extensive total area. Its capital is Lansing, and the largest city is Detroit. Michigan’s major industries include auto, information technology, life sciences, and manufacturing. Corporations names should’t be confused with any existing corporate, not-for-profit, assumed corporate, reserved or registered names. Company Express will research your company name to make sure it meets Michigan’s standards. Remember, when you work with Company Express, we’ll take care of your incorporation filing for you. This information is presented only for your reference. Required documents: The state of Michigan requires businesses to file Articles of Incorporation with the Department of Energy, Labor and Economic Growth. Turnaround time: In general, turnaround time for incorporating a business in Michigan is 10-15 business days. Expedited filings, which require an additional fee, typically take 2-3 business days. Director qualifications: The Articles of Incorporation or bylaws may prescribe the qualifications for directors. A director is not required to be a shareholder or resident of Michigan or the U.S. unless spelled out in the articles or bylaws. Appearance in articles: Not required. Directors’ names and addresses do not have to appear in the Articles of Incorporation. 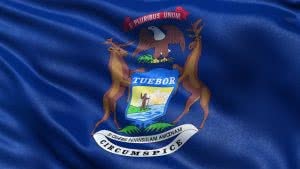 Time to file: Corporations must file a Michigan Domestic Corporation Information Update with the Department of Energy, Labor and Economic Growth on or before May 15. Filing fee is $15. Turnaround time: Turnaround time at the state is 10 business days. Filing extensions: Permitted. Filing extensions can be filed for two years. Limited Liability Companies must have names that can’t be confused with any existing entity, reserved, registered, or assumed name. Company Express will research your company name to make sure it meets Michigan’s standards. Turnaround time 12-17 business days. 2-3 days expedited filings are available for an additional fee. Time to file: Aannual report must be filed by February 15th and filing fee is $25. Signatures: Faxed signatures are accepted.